JACKSON, MS -With Winter Storm Helena pushing freezing temperatures, ice and snow into the Deep South, The Salvation Army is responding with a warm place to stay, a hot meal, and supplies for those in need across Alabama and Mississippi. The Tuscaloosa Corps opened a warming station Thursday evening as temperatures dropped. The Tuscaloosa’s Center of Hope has 73 beds available with the ability to take in up to 130 residents should the need arise. The warming station is expected to be open through the weekend. In locations as far south as Biloxi, Mississippi and Mobile, Alabama, The Salvation Army has opened its doors and is providing meals. In those locations, once the temperature drops below 40 degrees warming stations are open and shelters extend their hours to help all who don’t have a place to stay. “”We will open our cold weather shelter with meals until the temperature is better,” said Major Mark Brown, Coastal Alabama Command Officer. Even in places like Baton Rouge, where last August’s flooding left The Salvation Army without a shelter, officers and personnel will be moving through city streets offering blankets, soup, and coffee. The Columbus, Mississippi Corps will also deploy a warmth patrol in their area serving hot chocolate, coffee and handing out blankets. 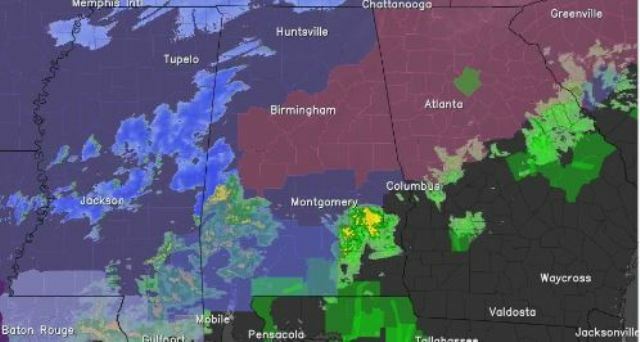 As the storm moves across Alabama, corps in Huntsville, Montgomery and Anniston, Alabama are ready to welcome those who need to get out of the dangerously cold temperatures. Local residents in need can expect all our locations to include extended hours for shelter as well as hot meals and beverages available to those who need to escape the cold. To find a Salvation Army Corps in your area, please call 1-800-SAL-ARMY or log onto our website at salvationarmyalm.org and click on LOCATIONS.